Typically when we talk about Angora, we refer to Angora Rabbit Hair, while the fibers from the Angora Goat are more commonly known as Mohair. 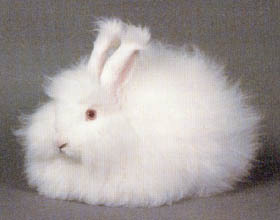 There are 4 different angora rabbit breeds, namely, English, French, Satin and Giant. Angora wool harvested from these rabbits are lightweight, silky, fine, and very soft. It is 7 times warmer than wool, and is ideal for baby clothes, winter underwear, sweaters and mittens. As only a small amount of wool can be harvested from these adorable creatures, angora is often combined with other fibers to minimize the high cost of this luxurious fiber. 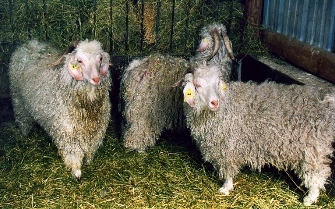 Yarns made from the fibers of these animals are very soft, lustrous, lightweight and warm. Alpaca is often used for the manufacture of warm, luxurious apparel. 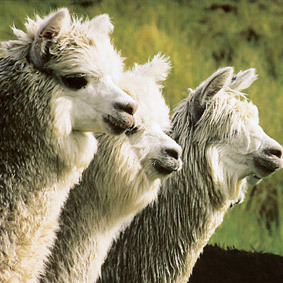 The down hairs of the Llama will produce a soft yarn also suitable for the manufacture of apparel. Camel hair is from the extremely soft and fine fur from the undercoat of the camel. Camel's hair can be used alone but is most often combined with fine wool for overcoating, topcoating, sportswear and sports hosiery. Vicuna is the world´s most valuable fiber. Vicuna is small and wild and belongs to the Camel family. It yields the finest animal fiber in the world. This fiber is rare and very expensive. Cashmere, also known as the fiber of kings, is produced from the fine, soft undercoat of hair of the Kashmir goat. Sixty percent of the world's supply of cashmere is produced in China, Mongolia and Tibet, and the remainder from Turkey, Afghanistan, Iraq, Iran, Kashmere, Australia and New Zealand. Cashmere yarn is extremely soft, lightweight, yet very warm. It is very luxurious and possesses excellent drape. As each Kashmir goat is capable of producing an average of only 4-6 ounces of underdown per year, Cashmere is hence very expensive. Wool is a natural fiber made from the fleece of sheep. Talk about wool and it conjures up a picture of cozy warmth. However, wool is not uniform among all sheep. Sheep live in a wide variety of climates and conditions, and develop their wool to suit the conditions under which they live or are bred. Today there are different grades of wool for different uses. There are coarse wools for carpets, soft fine wools for undergarments, highly crimped wools for bulky woolen yarns, wools with very long fibers for strong fine worsted yarns - a wide range from which the textile manufacturers can choose for a specific product. The most valuable of wools is Merino wool. Merino wool is a very long staple, extremely fine wool from the Merino sheep. Merino wool, particularly when twisted into a worsted yarn, is smooth to the skin. The fine fibres are soft, and the long staple gives fewer ends, reducing any irritation from loose ends. Wool is popular in the manufacture of clothing and home furnishings as it is warm, resists wrinkle, is lightweight and durable, absorbs moisture, is flame resistant, and has a natural stretch and elasticity. Silk is a natural protein fibre containing about 70-75% of actual fibre fibroin secreted from two salivary glands in the head of the silkworm larva, and about 25-30% sericin, a gum which cements the two filaments together. Silk of the finest quality is obtained from the unwound filament of the silkworm cocoon. To obtain lower grades of silk, broken or waste filaments and damaged cocoons are retained, treated to remove the sericin, and combed. This is then processed into yarn, marketed as spun silk, which is inferior in character to the reeled product and much cheaper. 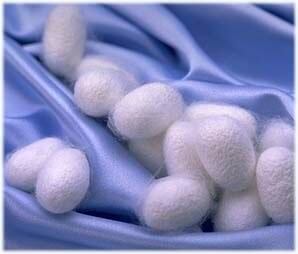 Low grade silk is made from damaged cocoons that were spoiled by emerging moths used for breeding stock. Filaments from the coarse outer portion of the cocoon, which is removed by brushing before reeling, and the inner portion of the cocoon, which remains after reeling the raw silk, are mixed with silk from damaged cocoons to make low grade silk. Silk has a high natural lustre and sheen of a white or cream color. It has a reputation as a luxurious and sensuous fabric, retains its shape, drapes well, caresses the figure, and shimmers with a luster all its own. Silk is naturally hypoallergenic, yet is still breathable; it absorbs moisture and reduces humidity, which makes it cool in the summer and warm in the winter. While silk is one of the strongest fiber at 2.6 to 4.8 grams per denier, it can be weakened by perspiration, deodorants and sunlight. Silk is absorbent so it dyes easily, but some dye colors tend to bleed and fade in water and during stain removal procedures. Sunlight will fade silk items and turn white silk garments yellow. 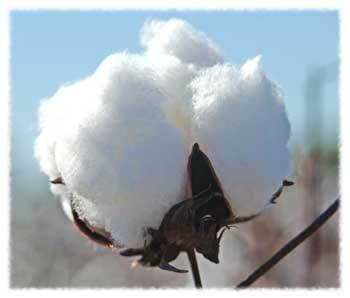 Grades of cotton range from low, medium to high quality grades like Egyptian cotton, Pima, Supima, American Egyptian and Sea Island cotton. Today, organic cotton is also available where the cotton plant is grown without the use of commercial pesticides and fertilizers. Cotton can stand high temperatures and takes dyes easily. Chlorine bleach can be used to restore white garments to a clear white but this bleach may yellow chemically finished cottons or remove color in dyed cottons. Boiling and sterilizing temperatures can also be used on cotton without disintegration. Cotton can also be ironed at relatively high temperatures, stands up to abrasion and wears well. Cotton products can typically be machine washed and dried. Colored cotton garments retain their color longer if they are washed in warm or cool water. Sunlight does harm cotton by causing it to oxidize and turn yellow. Fabrics that are 100% cotton do shrink if they have not been treated with a durable-press or a shrinkage-resistant finish. Organic Cotton is cotton that is grown using methods and materials that have a low impact on the environment. Organic production systems replenish and maintain soil fertility, reduce the use of toxic and persistent pesticides and fertilizers, and build biologically diverse agriculture. Third-party certification organizations verify that organic producers use only methods and materials allowed in organic production. Linen is a plant fiber made from the stalk of the flax plant. It is one of the earliest fibers to be made into string and cloth and is the strongest of the vegetable fibers, with 2 to 3 times the strength of cotton. Like cotton, linen takes to dyes easily and can be boiled without damaging the fiber. Fabrics made from linen are comfortable, highly absorbent, and has a natural luster and crisp hand. Linen wrinkles easily but also presses easily. It has poor elasticity and does not spring back readily like wool. While rayon is man-made, it is not considered a synthetic fiber, but a manufactured regenerated cellulosic fiber. Made from cellulose, rayon is a very versatile fiber and exhibits the same comfort properties as other natural fibers. It can imitate the feel and texture of silk, wool cotton and linen. The fibers are easily dyed in a wide range of colors. Rayon drapes well, has a soft, silky hand, and has a smooth, napped, or bulky surface. Rayon is highly absorbent but does not insulate body heat, hence making rayon garments ideal for use in hot and humid climates. The durability and appearance retention of regular rayon are low and will wrinkle easily and may stretch when wet and shrink when washed. Rayon also has the lowest elastic recovery of any fiber. Ramie, also known as China grass, is one of the oldest and strongest natural plant fibers principally used in fabric production. Similar to linen, it is natural white in color, has a high luster and an unusual resistance to bacteria and molds. It is very absorbent (more absorbent than linen) and is even stronger when wet. It is, however, stiff and brittle and not as durable as other fibers, and is best in blends with other fibers such as cotton or wool. Hemp is a bast fiber plant similar to flax, kenaf, jute and ramie. It possesses properties similar to other bast fibers (flax, kenaf, jute and ramie) and excels in fiber length, strength, durability, absorbency, antimildew and antimicrobial properties. The highest quality hemp comes from the "true" hemp plant called Cannabis Sativa. Sisal hemp and Manila hemp (also known as Abaca) are lower quality hemp fibers. Hemp can have a rather harsh hand. Therefore, it is best utilized in blends with other fibers (i.e. cotton, silk, wool, polyester). The finest hemp for fabric is produced in Italy. Hemp fabric is like linen in both hand and appearance. Hemp fabric withstands water better than any other textile product. It wrinkles easily and should not be creased excessively to avoid wear and breakage of the fibers. Jute is a long, soft, shiny vegetable fiber that can be spun into coarse, strong threads. Jute is commonly used in the production of bags, sacks, canvas, rope, jute yarn, twine and backings for carpet. Acrylic fiber is a synthetic polymer fiber that contains at least 85% acrylonitrile. Soft, lightweight, springy and warm, acrylic is comfortable to wear and resembles wool, yet is easy to care and is machine washable. Fabrics made from acrylic are generally non-allergenic, resilient, durable, have outstanding wickability, and are resistant to moths, oils, chemicals and sunlight degradation. Acrylic fibers may frequently be found in combination with other natural fibers. Nylon was historically developed as a synthetic substitute for silk. It is lightweight, drapes well, has low absorbency and dries quickly, and is resistant to dirt, chemicals and perspiration. One of the strongest man-made fiber, the use of nylon can be found in apparel, home furnishings and outdoor equipment that take a lot of hard wear, like stockings, swimwear, activewear, upholstery, tents and life vests. Polyester is a strong fiber that is resistant to crease, stretching and shrinkage, hence the ability to hold its shape well. Touted the best 'wash-and-wear' fiber, polyester is easy to care for and is washable, hence its wide usage in essentially every form of apparel and home furnishings. Blends of polyester with natural fibers such as cotton, rayon, or wool extend the durability of these blended fabrics. Microfiber is a manufactured fiber with strands thinner than one denier. This is finer than the most delicate silk! Microfibers are not really fibers per se, but refer to ultrafine fibers. Microfibers available today include polyester microfibers, nylon microfiber, rayon microfiber and acrylic microfiber. Fabrics made with microfiber are extremely soft and drapeable, and insulates well against rain, wind and cold. Olefin is probably one of the less known manufactured fiber in the apparel industry. Strong, lightweight, comfortable. quick drying and resistant to stains, soil, chemicals, mildew, weather, sunlight and abrasion, olefin has been used almost exclusively in the home furnishings area and the high performance activewear market, for such items as backpacking, canoeing, and mountain climbing apparel since its development in 1961. More recently, we are seeing a higher usage of olefin in activewear, sportswear, socks, thermal underwear and lining fabrics.